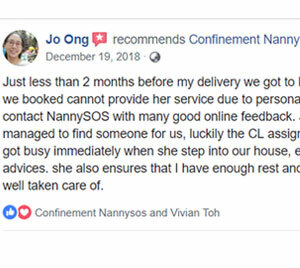 Just less than 2 months before my delivery we got to know that the private confinement lady that we booked cannot provide her service due to personal reasons, so we decided to contact NannySOS with many good online feedback. Juztin is very responsive and managed to find someone for us, luckily the confinement lady assigned to us is Nanny Zhen! She got busy immediately when she step into our house, enjoyed her cooking and advices. she also ensures that I have enough rest and both my newborn and me is well taken care of.